#99029 - 06/11/2003 23:57 Re: AWS Sites in Australia - photos and descript. #99030 - 14/11/2003 16:07 Re: AWS Sites in Australia - photos and descript. Here is the Wagga Wagga BoM Office and Radar based at the Airport (You can just see a plane on the left corner of the building ) and 2nd pic is looking to the airport and other stuff the BoM use. .
#99031 - 15/11/2003 03:29 Re: AWS Sites in Australia - photos and descript. Here`s a pan using 2 images (Not the best but gives you an idea how it`s setup. #99032 - 26/12/2003 21:19 Re: AWS Sites in Australia - photos and descript. Pt. Perpendicular - AWS but strangely no wind readings. 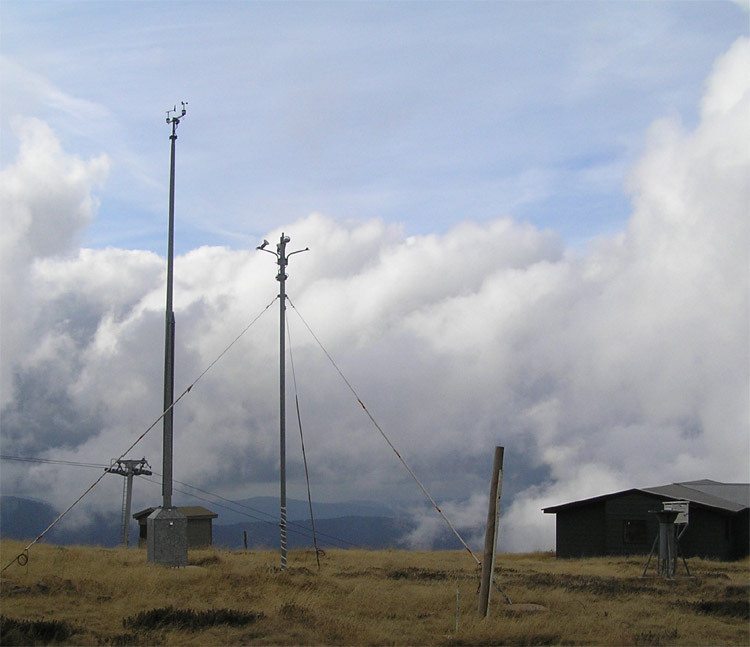 They would be quite fun in an ECL or a decent southerly as this station is basically 85m above the Pacific Ocean. Nerriga - 9am and 3pm manual SYNOPs, but there does seem to be some sophisticated comms gear there. Perhaps it could be put to better use. #99033 - 07/03/2004 23:29 Re: AWS Sites in Australia - photos and descript. 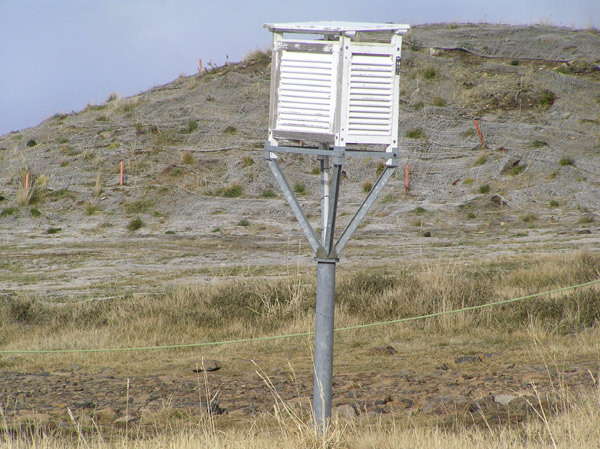 Getting down to the nitty gritty now... :rolleyes: I took a few pics of the BoM Hydrology Unit's rainfall gadget about 6km east of the village here. It appears to be the same bit of equipment as that in the Nerriga shot above. As you can see, they're designed to be located in the middle of paddocks like this one, where sheep and cattle will use them as back-scratching implements (note the churned ground around its base). It's a pretty solid unit, and all the stuff that matters is over 2m off the ground with the guage on top. It's unfortunate that they don't add a bit more gear to these things. As I've said above, it seems a wast of an impressive piece of equipment to only use it on the occasions that it rains. #99034 - 07/03/2004 23:52 Re: AWS Sites in Australia - photos and descript. What about portable BoM AWS's ? What is the story with them ? Perhaps Mark or Laurier may know ? I was stunned to learn today that last year, BoM installed some sort of AWS at the Campsie South Bowling Club on the corner of Alfred St and Jarrett St Clemton Park (only 200m from me ! ), and didn't tell anyone, and it never came up on any BoM list I saw, or I would have jumped on it ! I was talking to the club secretary today, and he told me it was there for about 3 months, complete with antenas for coms etc, then they took it away, no explanation apparently offered ! #99035 - 08/03/2004 18:21 Re: AWS Sites in Australia - photos and descript. I went down to the bowling club this morning, and got to the bottom of the story from an interrogation of the greenkeeper. He has taken over a year ago (when his apprenticeship ended) from the previous greenkeeper who trained him, who had been there for 7 years, and who kept religious rainfall records all that time. The current keeper has continued the records, so there is nearly 8 years worth of rainfall data, apparently good quality data. Would BoM be interested ? If so I could transfer it all to a spreadsheet and send it in. Is it worth the trouble ? #99036 - 08/06/2004 14:23 Re: AWS Sites in Australia - photos and descript. 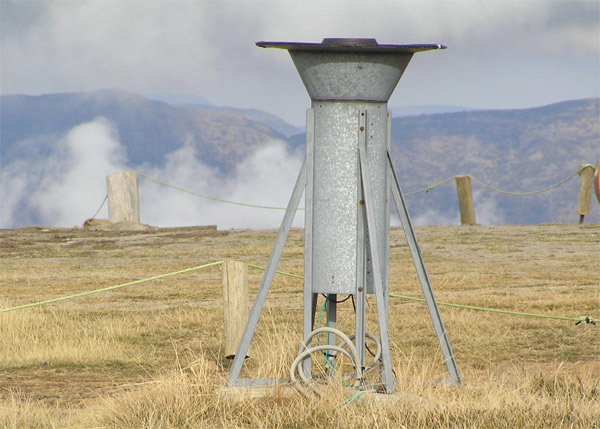 Liawenee AWS in the Central Highlands, near Great Lake, Tasmania. Taken June 5th 2004. Was great being in such beautiful territory with snow on the ground, seeing the AWS of the frequently reported 'coldest place in Australia' on many days. #99037 - 08/06/2004 14:38 Re: AWS Sites in Australia - photos and descript. Well done David, I was hoping you'd add those pics here. #99038 - 22/07/2004 08:06 Re: AWS Sites in Australia - photos and descript. 1332 metres above sea level. It faces north east. #99039 - 21/01/2006 20:41 Re: AWS Sites in Australia - photos and descript. Thought of this thread while on our holiday this week in Eden . Here is Green Cape overlooking Disaster bay in a strong southerly. #99040 - 25/01/2006 20:38 Re: AWS Sites in Australia - photos and descript. They've taken the screen away from the Katoomba site but the readings are still being taken, presumably from the new spot. Wonder if its still nearby as Katoomba is pretty diverse for possible locations. #99041 - 25/01/2006 20:58 Re: AWS Sites in Australia - photos and descript. #99042 - 26/01/2006 01:03 Re: AWS Sites in Australia - photos and descript. Just reposting the Noarlunga AWS (southern suburb of Adelaide) as the link has changed. The view in the photo is towards the SE overlooking the Southern Expressway (it travels north-south) which is only about 60m away to the east of this AWS ... just on the other side of that shrub you can see in the centre of the photo ... down in the gully. #99043 - 27/01/2006 20:27 Re: AWS Sites in Australia - photos and descript. its been great to reread this thread. #99044 - 02/02/2006 21:51 Re: AWS Sites in Australia - photos and descript. Low Head (Tasmania) AWS at the entrance to the Tamar River, Bass Strait in the background. The AWS is situated on the Low Head Lighthouse grounds. For those interested, In 1808, the Hebe was wrecked on the rocks at the mouth to the Tamar, thence giving them its name. Altogether, a dozen ships were wrecked in the Tamar over the next 100 years. A pilots and a signal station was established at Low Head (Georgetown) in 1805 and is Australia's oldest continuously used pilot station. Current buildings date from 1838. When a sail was sighted at dusk, a fire was lit and kept burning all night to keep the vessel in touch with the port. After a review of pilotage in 1827 it was resolved to build a lighthouse at Low Head. The tower was built in 1833. It was constructed of local rubble with a coat of stucco to make the structure durable and to provide a worthwhile landmark. The crown was built of freestone from Launceston. #99045 - 17/05/2006 18:13 Re: AWS Sites in Australia - photos and descript. The station is probably about 100 - 150 below the summit. 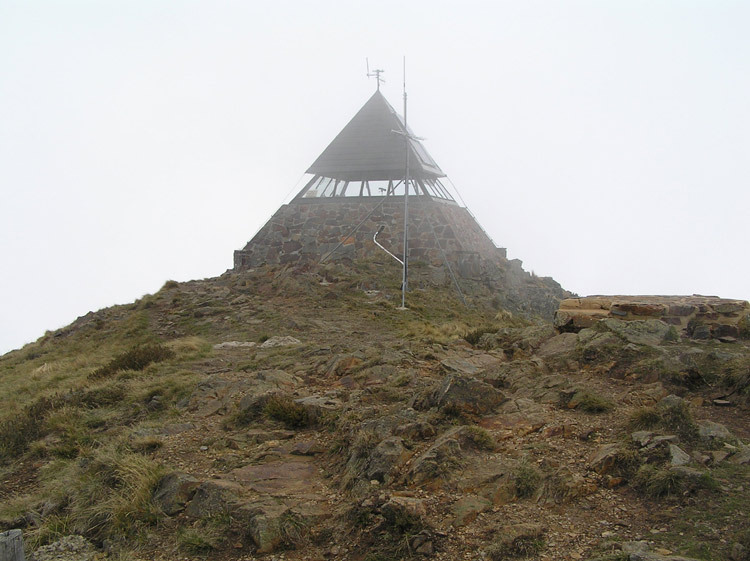 Just for interest this is the Fire Tower right on the summit. Now how do a get a job working in that ! #99046 - 17/05/2006 19:37 Re: AWS Sites in Australia - photos and descript. I should mention Mt Buller is in the Victorian Alpine area. with light winds and heavy fog / cloud. #99047 - 23/02/2007 01:46 Re: AWS Sites in Australia - photos and descript. Just thought i'd bring this thread back to life! 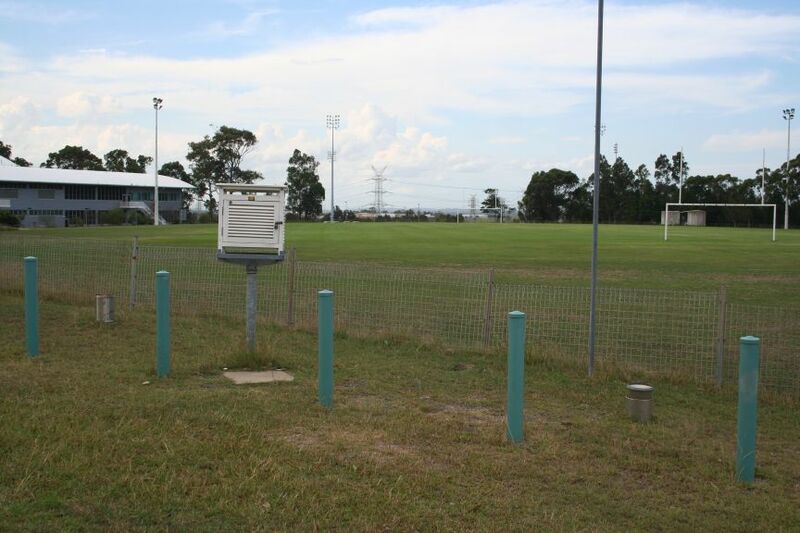 Here is the Newcastle Uni wxstation - not an AWS but still a BoM station. Stumbled across this one on my first official day at Uni on Mon - couldn't find anything else that day but no problems finding the wxstation LOL! It's located between Oval number 2 & the roundabout for anyone interested. Asked plenty of people during orientation week but nobody knew about it. 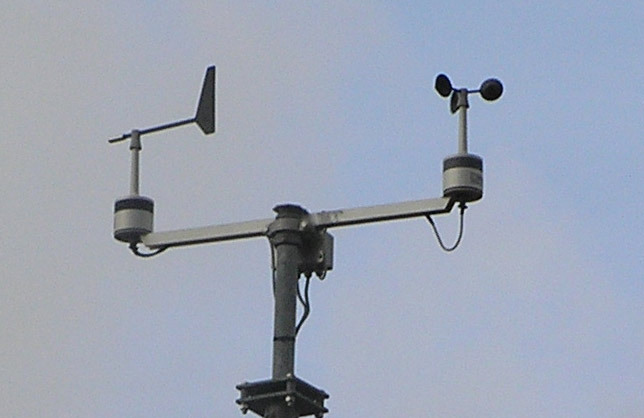 Also found what looks like a Davis anemometer on top of a building roof near one of the far car parks to the far NE. #99048 - 22/04/2007 18:43 Re: AWS Sites in Australia - photos and descript. Vegetation (grasses, lichens) is just bordering on sub-alpine on the exposed parts with temperate forest just metres below it. 4 registered (wet sky, Teddy, DDstorm, 1 invisible), 60 Guests and 3 Spiders online.